After rigorous testing and research, we settled on the 18-channel PreSonus StudioLive AR16 as our best audio mixer. We loved its ease of use – it makes mixing and recording live shows, studio productions, podcasts, and so on extremely easy. It is packed with analog connections and digital tools. For our second best audio mixer, we chose the 16-channel Mackie DL 1608. It combines a full-featured mixer’s power with an iPad’s ease of use. With it, you can control the mix and plugin processing wirelessly from anywhere in the venue. You have total control of the mix via your iPod. If you are looking for a good mixer at an affordable price, our best recommendation is the Behringer Xenyx X1222USB. Its best features include 4 state-of-the-art mic preamps, 4 studio-grade compressors with easy-to-use one-knob functionality, a design perfect for handling live gigs, high headroom mic preamps which deliver great sound, and built-in stereo USB/audio interface which enables direct connection to your laptop or desktop. An audio mixer is a device that receives audio signals from multiple inputs which it then channels into a harmonious sound. After combining and processing the signals, it routes them to wherever they should go. It gives you control over aspects various aspects of music, such as tone, volume, and timbre. These days, mixing is possible with many more devices. If you install the right apps and interfaces, you can mix using your tablet or smartphone. Digital Audio Workstation (DAW) software also comes with a variety of mixing capabilities. However, many audio professionals, musicians, and home studio owners still consider audio mixers to be the best option. The best advantage they have over other alternatives is that they have real faders, buttons, and knobs you can touch and manipulate. A channel is a path through which an audio signal travels. The best devices are those with a large channel count since they allow the connection and routing of more peripherals. Channels accept dynamic microphones and line-level devices like signal processors, preamps, and amplifiers. A microphone preamp which makes the relatively weak mic signal ready for processing by boosting it to line-level strength. An input jack which enables an external instrument such as a microphone to connect to the mixer. Equalization (EQ) – adjusts the audio signal’s frequency response. Routing – to direct the signal to other mixer circuitry and to external devices. Meter – provides a visual display of each channel’s output. Fader – sliding along a track, it controls a channel’s input and output. I/O is the inputs/outputs of the mixing device. What inputs and outputs you need, and how many of them you need depends on how you intend to use the device. 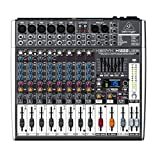 Example: when mixing live sound, the mixer should have sufficient inputs to handle the microphones and other devices you need in addition to the outputs connected to the main and monitor speakers. Example 2: when mixing recordings, you must consider the number of instruments and performers you have to capture simultaneously. The I/O calculation in this scenario must also include the other devices in the signal chain and the recording process: microphone preamps, monitor speakers, headphones, signals and effects processors, and so on. These are circuit intersections which function as the meeting points of outputs from different channels. Each channel routes its audio signals to a particular bus or group of buses. The channel faders feed the master mix bus, and it in turn transmits the mixer’s main output to the speakers or recorder. There are also auxiliary buses which receive their signals from the volume controls of the channels they are connected to. Auxiliary buses send these signals out using their own output jacks. These are called post-fader sends. On the other hand, if the auxiliary buses act independently of a channel’s volume, they are called pre-fader sends. The group function in a mixer enables you to control and process multiple channels as a collective. A group shares the same signal processing and routing, with all channels controlled by the same fader, allowing easier control of the master bus’s output. Illustration: a drum kit’s microphones will all get assigned to a single group to enable easier control of the overall drum sound and volume. If your mixing device has a mute function, it is highly useful when you want to silence an entire group of inputs or open mics – for instance, if you want to make an onstage announcement. A channel insert enables you to connect external sound processors such as equalizers and compressors to specific channels. It enables the feeding of a mixer’s preamplifier output to recording systems and external audio interfaces. It enables you to listen in on channels without causing any effect to the mixer’s output. You listen to the signal before or after it has been affected by the signal: pre-fader and after-fader listening. The former enables you to listen to the original signal while the latter enables you to isolate the signal affected by the fader (helps you to troubleshoot signals). They may not be as versatile as digital ones, but they are still popular thanks to their affordability and ease of use. One of their best advantages is the intuitiveness they bring to the process thanks to their physical knobs, faders, and switches. However this reliance on physical controls has its downside. Analog mixers have a larger digital footprint, and that is a disadvantage if you are operating on a cramped stage or crowded home studio. Their hardware and signal routing is easier for most people to quickly understand because everything is physically present as opposed to being obscured in a digital soundboard’s multiple status screens and their menus. The best advantages of digital mixers include a vast array of effects possibilities, flexible and extensive signal dynamics, and the ability to make instant changes to the signal routing. With the mere touch of a button, you will trigger preprogrammed routing and effects on digital mixers which would be daunting for even talented DJs to imitate on an analog mixer. Another feature that makes a digital mixer the best choice is that their compatibility with software plugins enables you to extend your device’s tone-shaping capabilities. They also have automatic gating, a feature which silences channels that have little or no signal passing through them. In addition, they enable you to save mixes – either in internal memory or USB flash drives. This comes in handy when setting up in a venue that you had previously performed in and saved. It also makes sound checks easier in a new venue which is similar to one you have saved. With some digital mixers, you can pre-program your mixes on a laptop, and when you arrive at your gig all you have to do is fine-tune the sound. Nowadays, music production software can help you accomplish many of the things you can do with a physical device. Audio mixing apps enable basic audio mixing on Android or iOS smartphones and tablets. Software mixers are used in recording where they easily integrate virtual instruments, drum loops, samples, and so on in your production. Most support advanced MIDI (Music Instrument Digital Interface). Computer-based digital audio workstations (DAW) open up a world of possibilities. These enable you to handle live performances without needing to transport and set up separate power amplifiers to drive your unpowered main and monitor speakers. You can get them in a variety of sizes and configurations. They can handle anything you throw at them – from a solo acoustic guitarist using a few tools to a complete band with a variety of mics, electric instruments and large main and monitor speakers. These come with multiple turntables and CD players. They are designed and built to cater for the unique set of mixing needs that DJs have. They come packed with the right inputs for handling DJ gear, and integrate well with PAs and club sound systems. All-in-one PA systems comprise a powered mixer, speakers, and speaker cables. They have an easy configuration, and are easy to carry thanks to their light, compact build. They are best suited to small events and band lineups. We were biased towards devices which allow more input connections as these will give you more leg room to do your work – for instance, if you need to connect many mics, stereo keyboards, guitars and basses, and so on. This is an important point considering how a band’s needs grow over time as it acquires new players, gear, and so on. In choosing the best, we considered the applications a particular device is fit for. We have divided our selections into different categories, and some of these categories depend on application. For instance, we have the best ones for use in studio recording, live performance, or DJ mixes. The learning curve when it comes to mixing is steep. It helps to have a unit that has intuitive design which makes it easy to learn and teach how to use. We were biased towards those which have more features. We were looking for devices which offer a broad range of possibilities. Some of our categories are based on the type of audio mixer. 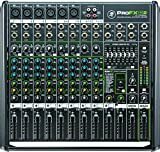 For instance, we have categories of the best analog vs. the best digital audio mixer, as well as the best powered and the best unpowered audio mixers. Our best audio mixer is the 18-channel PreSonus StudioLive AR16. It comes with 4 stereo and 8 mono stereo channels. Each of the channels have 60mm level fader, muter, pan, PFL solo, high pass filter, and 3-band semi-parametric EQ. With this unit, it’s very easy to mix and record things like studio productions, band rehearsals, live shows, studio productions, and podcasts. It’s one of the best choices for musicians. It is versatile, rich in features, lightweight, and is jam-packed with analog connections and useful digital tools. Best of all, it is easy to learn and to use. It provides an all-in-one solution for recording and mixing your performances. It has 2 instrument inputs, 2 insert points, 12 balanced mic inputs complete with class-A microphone preamps and 16 balanced line inputs. It has one stereo super channel which has RCA inputs, switchable SD/USB stereo playback, 1/8-inch stereo input, and Bluetooth 4.1 input. Thanks to the onboard Bluetooth, you can stream program music wirelessly. There is one stereo effects processor which has 16 presets, bypass footswitch jack, and dedicated send and return. You can connect your computer to the mixing device using USB 2.0. The 18 x 4 multi-track digital recorder will help you capture/record all input channels as well as the main mix to your Mac or Windows PC. The recording has professional, 24-bit/96 kHz quality. Thanks to an in-built stereo SD recorder, you can record the main mix without using a computer – all you have to do is hit Record and it will do it. Clearly, this is the best audio mixer for anyone who wants to record their music. The cooling system is not very well designed. The unit has fans, and these can tend to produce a fan noise. Our second best audio mixer is the Mackie DL 1608. An awesome 16-channel mixing device, it unites the power of a digital mixer which contains all features with the ease of use you get from an iPad. It is the best device for bands and productions/installations. One of the best things about this digital mixer is that it gives you the freedom to control the mix and plug-in processing wirelessly from anywhere in the venue. You can mix from any location within the venue using your iPad. As a result, you can do the best possible tuning of the room to ensure everyone gets the best sound from their seats. Another thing that puts it in the league of the best is its impressive amount of processing that it avails to every input and output. The iPad is one of the best touch interfaces in the world. With Mackie’s Master Fader app, you get total control of your mix on the iPad. The app has an intuitive design, which makes it very easy to learn and even to teach. You get powerful hands-on control of input/output processing, complex show management and device configuration, and excellent wireless control. Other features include global reverb and delay, present and snapshot recall, 16 Onyx mic preamps, high-end Cirrus Logic converters, seamless wired to wireless mixing, 6 stereo-linkable aux -ends for monitor mixes, and Master L/R output for mains. 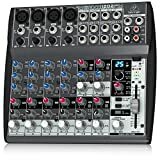 If you are looking for a good-enough compact audio mixer at an affordable price, your best option is the Behringer Xenyx USB. It has 4 state-of the art mic preamps which are similar to stand-alone boutique amps. It has 4 studio-grade compressors which come with extremely easy-to-use one-knob functionality and control LED for pro-level instrumental and vocal sound. Its design makes it one of the best for handling live gigs. It has state-of-the-art tools which will help you make pro-quality recordings. It also has all the recording and editing software you require to transform your computer system fully into a high-performance home recording studio. It comes with high headroom mic preamps which have a truly great sound. These preamps provide an impressive 130 dB of dynamic range, and a bandwidth extending from below 10 Hz to over 200 kHz. As a result, you get transparent, crystal-clear performance. The Xenyx FX has British EQ. British consoles revolutionized rock and roll back in the 60s and 70s, making the famous British Invasion a thing. The channel EQ on this mixing device is based on the same circuitry as those legendary consoles. It enables you to fill signals with warmth and detailed musical character for the best-quality sound. It has a 7-band stereo graphic EQ that enables precise frequency correction of monitor or main mixes. It has built-in stereo USB/Audio interface which enables you connect directly to your computer. You can also access audio recording, audio files editing and podcasting with 150 instrument/effect plug-ins and ultra-low latency driver for free (downloadable audio editor) at www.behringer.com. Other features include voice canceller function to ensure easy-to-use sing-along applications, one pre-fader for monitoring, an FBQ feedback detection system that reveals critical frequencies instantly, 2 aux-sends per channel, one post-fader, and 2 multi-functional stereo aux returns. Our best analog mixer is the Behringer Xenyx 1202FX. It has 12 inputs and 2 buses, and has Xenyx mic preamps, British EQs, and Multi-FX processor. Thanks to these features, this compact mixer enables you to create premium sound quality effortlessly. For incredible versatility during your live performances, it has 24-bit, dual engine FX processor with 100 presets which include chorus, reverb, delay, flanger, pitch shifter and other multi-effects. The Xenyx mic preamps are considered to be among the best. They are state-of-the-art and are capable of holding their own when you compare them to the best stand-alone mic preamps. They provide incredible 130 dB of dynamic range, and a bandwidth which extends from below 10 Hz to over 200 kHz. Thanks to these preamps, you can count on a great, crystal-clear performance. The British EQ imbues signals with warmth and a detailed musical character for the best-quality sound. It has studio-grade 24-bit Multi-FX processor which provides 100 digital effect presets such as chorus, reverb, and delay. You can apply them to any channel, and also to the monitors and main output. These features make it best suited for live gigs. Our best audio mixer for live gigs is the 12-channel Mackie PROFX12V2. It gives you the best, comprehensive live sound solution. The Mackie Vita preamps are designed and built to cater specifically for live sound. They are virtually noiseless, and have a discrete Class-A front end design with dual feedback stabilization and bias current optimization which ensures excellent low-noise performance. Its ReadyFX effects engine uses floating-point DSP which is designed specifically for intensive processing of high-quality audio. The result is rich effects which are the best for elevating performances and inspiring audiences. This optical audio mixer also has a well-stocked audio toolkit. The toolkit contains critical tools like multi-band graphic equalization as well as smart features like channel inserts. You can always count on the PROFX12V2 to have the tools you need. It also has built-in USB interface which ensures easy recording of your mix or music playback during your live show. It has Traktion recording software which is easy-to-use and helps you get started right away. Our best audio mixer for the studio is the Tacsam DP-32SD 32-Track Digital Portacstudio Recorder. This digital mixer has simultaneous 32-track recording, simultaneous 8-track recording, and integrated 40-input mixer to mix down the 32 playback tracks with the 8 inputs or for bouncing. It records 32 tracks to solid-state media. The 8 tracks are recorded through the combination XLR inputs and ¼-inch combo jacks. Input processing – like limiting and compression – is available during recording. Also available are guitar amp simulation, multi-channel audio editing and multi-effects for use with the instrument-level input. It has a 3.5-inch full-color LCD and self-illuminated channel strip knobs which make the mixing process fast and more creative.It comes with a 4GB SD card which you can replace with up to 32 GB SHC media or swap with other cards when switching between projects. One of the best things about it is that it is one of the easiest multi-track recording machines to use. It has 21 faders which eliminate layer structuring. These comprise 20-track faders and one master fader. As a result, you can control any track with ease. Our best audio mixer for DJs is the 5-channel Behringer Digital Pro Mixer DDM4000 which comes with a beat-synchronized sampler, 4 multi-FX sections, 2 BPM counters, digital crossfader and MIDI. It has 4 phono/line stereo channels which enable the simultaneous connection of up to 8 signal sources. Though packed with creative tools, this state-of-the –art mixer has an intuitive layout that makes it easy to use. It is very easy to carry out functions such as editing, storing, and recalling your settings. As a DJ, all you have to do is hook up your turntables and CD/MP3 players to the 4 stereo channels in the karaoke mixer. Each of the channels has fully programmable EQ and kill switches. Best of all, it provides extreme versatility with its fully programmable multi-FX module that allows you to sync beats, two high-precision BPM counters and a digital crossfader with custom curve adjustment. The BPM-sync’d sampler allows you to control pitch in real-time, while the reverse functions will give your performances an extra jolt that will make audiences go wild . For the best powered audio mixer, we chose the 5-channel Peavey PVi 6500. It is an all-in-one powered mixer which has everything a musician requires. It has features such as the Mid Morph EQ which help improve the vocals’ clarity and tone. Thanks to the 9-band graphic EQ combined with the Feedback Locating System, it is easy to quickly identify feedback. It is equipped with Kosmos which enhances the low as well as the high end of the audio spectrum. It is one of the best choices for audiences of up to 100 people, schools, bands, churches, and carnivals. Other features include Mid Morph single knob EQ for easy setup, built-in digital effects and Bluetooth, LED meter bridge, Master Mute for channels 1-5, combination XLR and ¼-inch input jack, and onboard feedback identifying graphic EQ. These are the mixers which use external amplifiers – like powered speakers. Our best unpowered mixer is the Yamaha MG12XU 12-Input 4-Bus Mixer with Effects. It has powerful digital processing, studio-quality preamps, and a sturdy, reliable construction. The interfaces are intuitive and easy to use. The bass is natural-sounding, the highs smooth, and distortion is low. The audio mixer features studio-grade discrete class-A D-Pre preamps which use an inverted Darlington circuit that consists of two cascading transistors in a configuration that gives greater power and lower impedance. The D-Pre Preamps have a wide frequency range which enables them to handle signal from any audio source without amplifying any particular elements of the sound excessively. Other features include onboard digital effects, LED metering, a pad switch, switchable phantom power, metal chassis with XLR balanced outputs and internal universal power supply, bidirectional USB, and one-knob compressors. The Yamaha MG12XU provides excellent sound quality: a transparent, articulate sound. Our best multipurpose audio mixer is the Allen & Heath ZED-10FX. It is a multipurpose mixing device which has FX for recording and live sound. It is highly portable for easy transportation to the venue of your gig. You can use it for both live and studio recording. You can plug guitars in directly through the high-impedance inputs. The mixer comes with 2 stereo inputs for keyboards and your CD/MP3 players. It also has professional XLR stereo outputs as well as a flexible monitoring section which comes outputs for speakers and headphones. It has great USB audio flexibility, and you can easily get audio to and from your computer. It also has a responsive 3-band, swept mid frequency EQ design which uses MusiQ with optimized slope for the equalization of individual instruments. These are the best units in the categories we have chosen. If this were a longer article, there are so many other units we would have included. However, we focused on the best ten. It’s also worth noting that when coming up with this list, we confined ourselves to devices that most people can afford without having to rob a bank. Some units did not make it into this best list due to faults or various inefficiencies. These include lack of flexibility, lack of versatility, lack of enough input channels, lack of enough attractive features, bad sound quality, and so on. Q: How does one use a mixer? 1. Connect your audio equipment to the mixer’s inputs. The number of channels goes hand in hand with the number of inputs a unit can handle. For instance, a 12-chanel unit offers 12 audio inputs. Inputs include equipment like microphones, audio interfaces, and stereo devices. In some units, the inputs for mics and for CD and tape players are separate. The latter are referred to as line inputs. Such units have switches for toggling between mic and line inputs. Every musical instrument should have its own input. For instance, you can record 2 trumpets using a single mic input, but you cannot record a trumpet and a violin on the same audio input. For proper sound balance, you need to record them on separate inputs. With some instruments like drum sets, you will require separate mic inputs for different components. If your unit comes with subgroup channels, you can group the mics assigned to complex instruments like drum sets into one or two subgroups, after which you mix them separately, and then control the drum mix in the overall volume using one or two sliders. The more inputs a unit has, the larger it is. That’s why portable ones tend to be smaller, having only two or four inputs. If you have a 32 or 48-channel mixing console, you will have to transport it in a vehicle. Such large consoles are usually just kept in the recording studio. 2. Connect the recording/monitoring equipment to the unit’s outputs. The output is monitored on VU monitors or by plugging in headphones to an auxiliary output jack. 3. Turn on the channel inputs you will need to make your sound mix. Each channel comes with its own on/off switch. 4. If the item connected to a channel requires phantom power, turn on the phantom power for that channel. Phantom power refers to direct electric current which the mixing board supplies to connected instruments or mics. Inputs that need phantom power include microphones, amplifiers, and some video cameras. 5. Adjust each input’s volume according to the requirement. To do this, use the potentiometer (“pot”), which is in the form of a knob. The controller may also be in the form of a pad, a slider referred to as a fader or a switch. Each input requires its own level in order to achieve the best possible sound effects for the mix. You can turn individual channels on and off temporarily during recording to enable analysis of the master mix without them – do this using a mute switch. You can also use a solo switch to mute all channels except a specific channel which you want heard by itself. 6. Make adjustments to each channel’s bass, treble, and mid-range bands using the equalizer controls. This will help you improve each sound range’s sound quality. The quality of a sound mixer often hinges on the quality of its equalizers. Audio mixers can come with equalizer controls for each separate channel in addition to a global equalizer which has an effect on the entire sound mix. 7. Route any channels which require special effects to an auxiliary channel. Aux channels create a copy of the original channel signal. You route using a control known as a “send”. 8. Pan each channel in the master mix according to requirement. You do this with a panoramic potentiometer (“pan pot” or “pan knob”). When you turn the knob left, the signal moves left of the stereo field. If you turn it right, the signal moves right. If your unit has multiple outputs, the pan knob will operate in tandem with routing buttons. Each routing button enables a pair of outputs. Turning the pan knob left moves the signal to the left enabled output bus. Turning the knob to the right moves the signal to the right output bus. Turn it to the center and both outputs go out. Q: What happens when you adjust the bass, treble, and mid ranges on the equalizer? A: You modify the sound by either cutting or boosting the lows, mids, and highs. The table below demonstrates the effects of this boosting and cutting. Crunchy, metallic echoing increases, with the tone becoming sharper. Boost too much, and the sound becomes noisy. Smoother tone. Effective “S” noise cancelling. Cut too much, and the high range transparency will be lost. Brighter, harder sound. Sound becomes modulated and bright. Boost too much, and the sound becomes unpleasant. Audio balance tends toward lows. Cut too much, and the audio becomes dark. The outline of the audio can be made clear. Audio sounding as if it’s projected forward. Emphasis on the attack of toms and bass drums. Rounder and more pleasant tones. Sounds more muffled, and no longer stand out in the mix. Thicker and more powerful sound. Tonal balance tends towards lows. Boost too much, and the sound becomes unnatural, sounding as though coming out of a telephone. Harder sound that has a feeling of attack. Tonal balance tends towards highs. Cut too much, and the sound becomes thinner. Deeper and rounder sound which has greater strength and a sense of scale. Boost too much, and the sound becomes less crisp. Sound becomes lighter and crispier. Floor noise or howl cancelling. Q: How do you output audio from the mixer? A: Outputs depend on the needs of a particular event. Examples of outputs are STEREO OUT, AUX SEND, GROUP OUT, PHONES, and REC OUT. STEREO OUT is what you use to send signals to the audience. AUX SENDs are for the performers’ monitor speakers and external devices. MONITOR OUT is for monitor speakers and is used when mixing audio in the studio. GROUP OUT is for outputting several signals simultaneously. PHONES is for headphone connection. REC OUT is for connecting with recording devices. AUX bus is a circuit useful for sending signals to external devices. It is used to send signals to performer’s monitor speakers separately from the main output. It is also for sending signals to external effects and recording devices. If your band has many people, you should choose a mixer that has many AUX sends. Also if you need to send separate monitor signals with individual balances to the performers. GROUP bus is a circuit used to control multiple channels simultaneously. For instance, if you have eight mics (eight channels) placed around a drum set and you want to adjust the volume of the entire set, it will be difficult to adjust the faders for all eight channels with accuracy. But if you set all these channels in one group, you can easily adjust the entire drum set’s volume and at the same time maintain balance by adjusting the fader for the group. STEREO bus is a circuit used to combine each input coming into the mixer or each GROUP bus signal, adjusting the overall level, and outputting the audio through stereo output connectors. Our best audio mixer is the PreSonus StudioLive AR16 which comes packed with an impressive 18 channels. It has 4 stereo and 8 mono channels. It has 2 instrument inputs, 2 insert points, 12 balanced mic inputs complete with class-A microphone preamps and 16 balanced line inputs. It guarantees ease of use when mixing band rehearsals, live shows, studio productions, podcasts, and so forth. It is jam-packed with analog connections and useful digital tools.